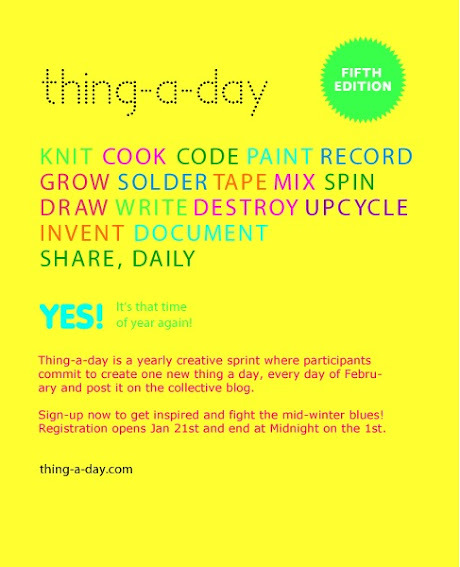 Thing-a-Day is a collective blog that pushes participants to create one new thing every day in February. Everyone then shares their daily projects or progress and we get to comment and glean inspiration from each other while instilling a habit of dedicating time to our practice each day. I don't know if I'll actually be successful at contributing something new every day, but there's so many ways you can be creative that it could only inspire me to do more with my time. Anybody else in? Registration ends midnight on the 1st. Oh this sounds cool!! I'm off to check it out - thanks! Sounds cool, but I'm going to pass. I'm having enough trouble keeping up with things at the moment!